The Colormix hand blender is a simple but effective solution to blend any ink batch after a dispense cycle. This excellent-value equipment allows manually operated blending of water-based or solvent-based inks in an economical and convenient way. The system consists of a stainless steel frame and a separate air-driven hand blender. 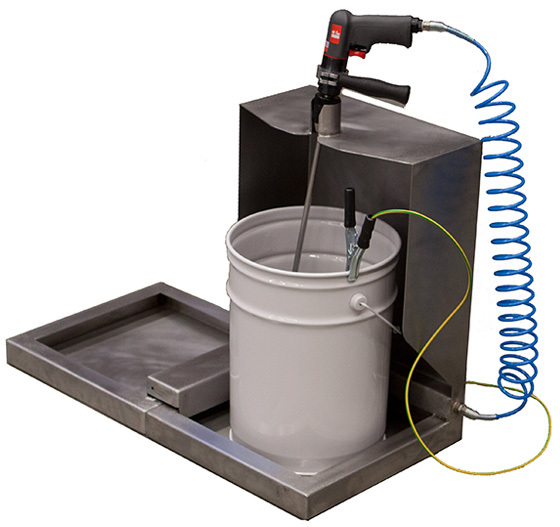 After dispensing, you can easily slide the bucket to the mixing position. The mixer will be placed manually in the ink bucket and the mixer is switched on. Within one minute, the ink batch is mixed and the mixer can be placed in the bucket with cleaning detergent. The modular design of the new Colormix allows seamless integration with your Colorsat Slim or Compact ink dispenser. The sliding weighing tray of the dispenser is attached to the slide tray of the mixer, which prevents ink dripping on the ground.